In the middle of Borough Market, in the Bankside area - south of the River Thames, is a restaurant called Fish!. I had a fish supper there early on Friday evening last week after going to see the SGFA exhibition at the Menier Gallery. Travelling late afternoon/early evening is always problematic for me due to my mobility problems and very poor balance. Part of my risk management strategy for this is to avoid the crowds in the rush hour on the tube - introduced after I managed to fall down half an escalator during a rush hour! I've found various ways of avoiding crowds and challenges to my mobility and one of the more pleasant - and productive - ways is to find a local cafe or restaurant and to have something to eat while I sketch and then go home when it is quieter. The main trick to eating and sketching at the same time is to order something which you can eat with a fork and is either cold or is unlikely to go cold quickly. In this particular instance I can confirm that their fish pie takes ages to go cold! This was a very complicated drawing in terms of structure and perspective but I think it came out OK. I'm now thinking about adding in some limited colour (maybe the structure of the beams between the windows?) and will update this post if I do so. I had tea in the Bramah Tea and Coffee Museum on Saturday afternoon. I'd walked from the SOFA exhibition at the Llewellyn Alexander Gallery in Waterloo to the Menier Gallery in Southwark Street, near London Bridge. The SGFA exhibition closed at midday and I was picking up my unsold artwork. The afternoon has suddenly got very warm and I was in need of a cup of tea - and right across the road from the Menier Gallery is the Bramah Tea and Coffee Museum at 40 Southwark Street. The museum is apparently the first one in the world to be devoted to telling the story of tea and coffee. It certainly seem to attract visitors from all over the globe. While I sat in the Tea Room a party of ladies arrived to take tea and I mentally christened them 'the russian ladies'. They seemed to enjoy their full English Afternoon Tea - that's cucumber sandwiches, hot crumpet, tea cake, cake and choice of tea! The Tea Room has the most amazing pink walls. I was rather tired and, sat in the tea room, I was very much inclined to draw just whatever I could see. My first drawing at the top is of a very small sample of the various teapots, tea caddies and tea on the pink shelves on the pink wall of the Tea Room and my second drawing is of the party of 'russian ladies' having tea. I had a peek at the museum at the rear of the tea room and it looks very extenstive - lots of interesting things to draw! 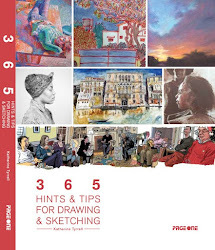 I've just spent three days trying to get my money out of Northern Rock - and took my sketchbook with me to the very long wait outside two different branches of Northern Rock on both Saturday (Bromley) and Monday (Houndsditch in the City of London). This post has drawings from the front line of the 'run' on a bank and some comment from me for the context of each one - from the perspective of the queue. Note I also now have a new category on this blog called 'life events'! We are in the middle of a bank run. We've never seen it on this scale in Britain - of a major bank - since the 19th century. The first sketch (below) was done on Saturday - after I heard about the problem with Northern Rock late on Friday night. I went to bed very worried as I had a sizable chunk of my life savings in Northern Rock and woke at 4.00am, got on the Internet and eventually decided that I had to go and get my money out. I went down to the closest branch which was open on Saturday morning - in Bromley in south east London. I got there at 9.00am and the queue already had several hundred people in it. It then took me 5 hours to move about 100 feet forward in the queue. BUT nobody who arrived after 8.00am got inside the branch on Saturday. On Friday, branch customers withdrew £1 billion pounds and we later learned another £1 billion was withdrawn in 5 hours on Saturday. I'd estimate about 90% of the queue at Bromley were pensioners - including some very elderly people and three people in wheelchairs. I'd estimate the average age of the queue to be about 70-75 years old - but some were much older. Anxieties forced us all to queue outside the branch for up to five hours. Virtually everybody in the queue at Bromley had - as I did - their pension lump sums or life time savings in Northern Rock. Naturally for a lot of people this was an awful lot of money and most had well in excess of the £35,000 compensation limit and most were planning to withdraw the lot. It was a very tense time. (Top) The sketch at the top is the scene outside the Northern Rock branch at 155 Houndsditch on Monday 17th September. I did this one from across the road in Starbucks at 12.30pm after I'd got my withdrawal lodged somewhere safe and before going home. Having queued for five hours on Saturday (and then spent all Saturday evening and Sunday 'seized up' and virtually immobile as a result) I decided I had to get to the branch nearest my home on Monday as early as possible. So I got up at 3.50am, got a taxi into the City of London and arrived at Houndsditch about 4.30am to find I was first in the queue! I then sat outside the branch for three and three quarter hours until the branch opened (I can highly recommend my new chair for comfort while sketching!). At 5.00am 'H' arrived. He was an 80 year old pensioner who had managed to get the last stand-by seat to fly back from abroad to get his money out. He'd got a lift in from a taxi driver. At 6.30am we had our photo taken by a man on his way to work in the city who could not believe what he was seeing and then we both gave interviews to the independent radio news reporter! Other people started to arrive at 6.00am and then there was a steady trickle joining the queue as the early morning tubes and trains started to arrive in the City of London. The next sketch (right) was done while I was sat inside the branch. The printer failed, the computer could not read my pass book and the manager had to update my book for interest by hand! I did this sketch while she was doing that. I'd chatted to this couple, both pensioners, in the queue for the previous two hours as we waited for the branch to open. I exchanged some pleasantries with the Branch Manager and we talked about how things used to be. Northern Rock used to be a Building Society until about 10 years ago. As with all building socities - before they converted to banks - in order to get a mortgage, you had to save with the building society first and then wait for an allocation from the 'quota' of funds which were released each month. It used to be that if depositer's funds dried up so did mortgages. I think it's a very great pity that it has changed and brought so much stress to so very many people, particularly pensioners. After this fiasco, I think we'll see a resurgence of "mutuals" limited to lending savers money for homes. It took about half an hour to update my savings passbook with all the interest and I walked out with a cheque for the amount which was the excess above the sum covered by the Government Compensation Scheme in the event of a failure of Northern Rock. It then took about two and half hours to get the cheque placed in a 100% Government backed National Savings and Investment account! Late in the afternoon, as the Chancellor and others began to realise that it was apparent that nobody believed what the CEO, the Bank of England, the FSA or the government had said so far,the Chancellor finally stated that all depositers money in Northern Rock would be guaranteed 100%. Which may have meant I wasted my time yesterday but did at least mean that I could get a good night's sleep last night and don't plan to get up early tomorrow morning to take the rest of my money out. It's now safe. The simple fact now is that the Chancellor has made it clear that all existing deposits in Northern Rock are fully backed by The Bank of England and are totally secure during the current instability in the financial markets. We are all working night and day to provide you with the service that you expect from us and deserve from us. And I would like to express my appreciation to our staff for their work and commitment over the last few difficult days. Above all I would also like to thank all our customers for their support and understanding. I am also pleased to announce that any customer who has paid a penalty for withdrawing their investment, will have the penalty refunded if they re-invest the same amount in the same type of account by 5th October 2007. Note: Please note all rights are reserved in respect of all images and text on this blog. 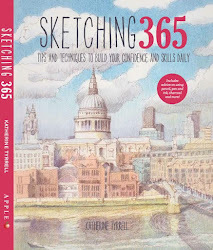 Please contact me if you want to copy either sketches or my comments. This post was first published in Marking A Mark on 20th October 2006. 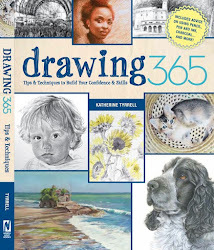 It's included in the summary of travels with a sketchbook in Kent. Sissinghurst Castle in Kent closes its house and gardens to the public a week on Sunday and does not reopen until March. I visited the garden late on Monday afternoon when it was very quiet and sketched the sixteenth century tower, in which Vita Sackville West had her writing room, and the grounds from the bank beyond the moat at the back of the gardens. My earlier post in August (ie the last post in this blog) details the background to the gardens and in this post you can see a small photo at the end which is the view I was drawing. I still can't decide what is the best crop for this view as one either has a picture with two halves or a picture with very heavy foliage on both side - neither of which is ideal. 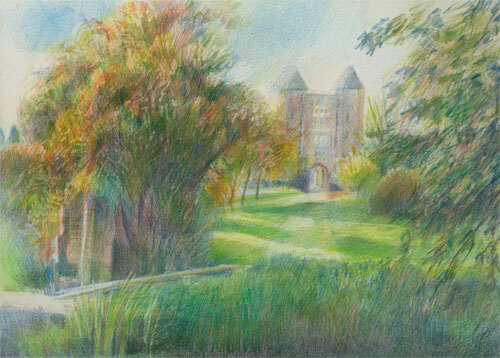 So this drawing really represents compromise #1 with just a smidgen of a hint of the long Moat Walk on the extreme left and rather more of the orchard in the right half. Having done a 'not very good' sketch I decided to exercise some artistic license and pushed the autumn colours a bit when I got back. However, I think I've probably introduced rather too many different colours as this was a total nightmare to scan and then colour adjust so that it reads right. I've also got a bit of feeling that my old problem with verticals has come back to haunt this one. There seems to be a distinct lurch to the right going on - which is possibly partly due to having 'eyeballed' the drawing of the tower while sat on the grass on a slope with my Saunders Waterford HP block on my knees. 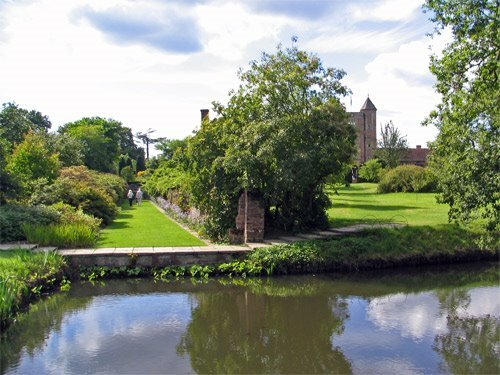 Sissinghurst can be very limiting as to set-ups because they won't allow a lot of things (easels/tripods/chairs) into the gardens because of health and safety concerns as the gardens are so popular. Overall though, it comes pretty close to what I saw around 5.00pm on Monday afternoon. 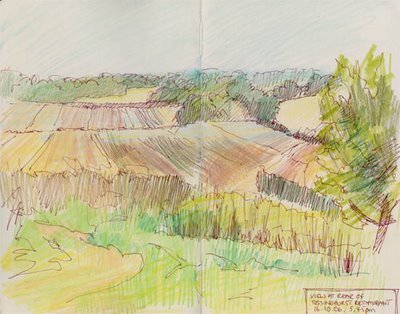 I then had a pot of tea in the barn restaurant and did another quick sketch of the fields at the back of the barns area. It had three distinct zones - lush green grass (and nettles) in the foreground, bare harvested fields in the middle ground and dusky green blue woods in the distance. As is often the way when you do something really quickly this one came together very quickly and looks like it might deserve being revisited in order to develop a more finished work. 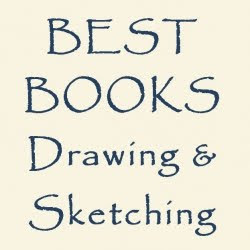 coloured pencil in Moleskine sketchbook 10" x 8"
This post was first published on Marking A Mark on 28th August 2006. 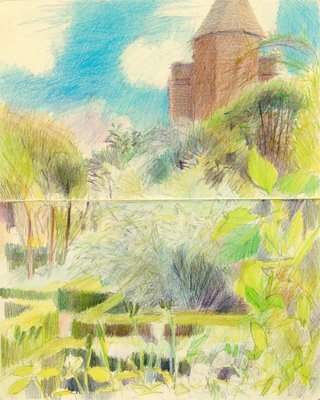 We went to Sissinghurst Gardens in Kent on Friday and I produced the above sketch while sat in the corner of the White Garden. 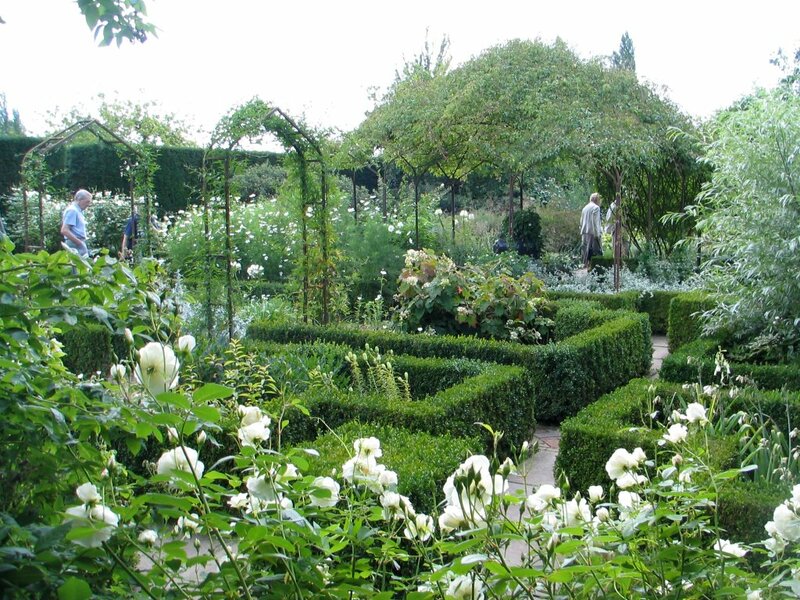 The White Garden only contains flowers which are white and rather a lot of 'silver/grey foliage plants. We were greatly irritated by a helicopter who hovered over the garden at a dangerously low height for about 20 minutes or more - a quite horrendous noise. My guess is that they were taking photographs - and also probably breaching air traffic control regulations! One of the world's most celebrated gardens, the creation of Vita Sackville-West and her husband Sir Harold Nicolson. Developed around the surviving parts of an Elizabethan mansion. A series of small, enclosed compartments, intimate in scale and romantic in atmosphere, provide outstanding design and colour throughout the season. It's difficult to know whether to call it a garden or gardens as there are no many different garden rooms' within the overall garden - which is probably one of the reasons why it proves so popular with visitors. The gardens are located in the Weald of Kent, near Goudhust and Tenderten. Directions to the gardens are given in the at the end. It's certainly well worth a visit any time any time you are in Kent. However, please note that the garden is unfortunately closed from the end of October until the middle of March each year. You can get a very good insight into what the gardens are like from this website about Sissinghurst which has been put together by a devotee and contains lots of photographs. Sissinghurst is unusual in that it will not allow either tripods or easels into the gardens while they are open to the public. However the NT do run courses at the gardens and you can also apply to visit when the garden would normally be closed. For details of events in the coming months see this link. One of the things I wanted to do on Friday was plan future visits and find potential alternative places to sit which would be out of the way of people and at the same time give me the space to spread out my kit. This is one of the views I found which will be getting a second visit. 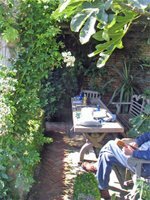 Links to previous posts about Sissinghurst on this blog are listed below. The next post will document the next visit which tackled the view seen in the last photo.